When we go out on location, we bring a lot of gear. We might forget to bring a cable, extra batteries, something…but we never forget to pack a multi-tool. 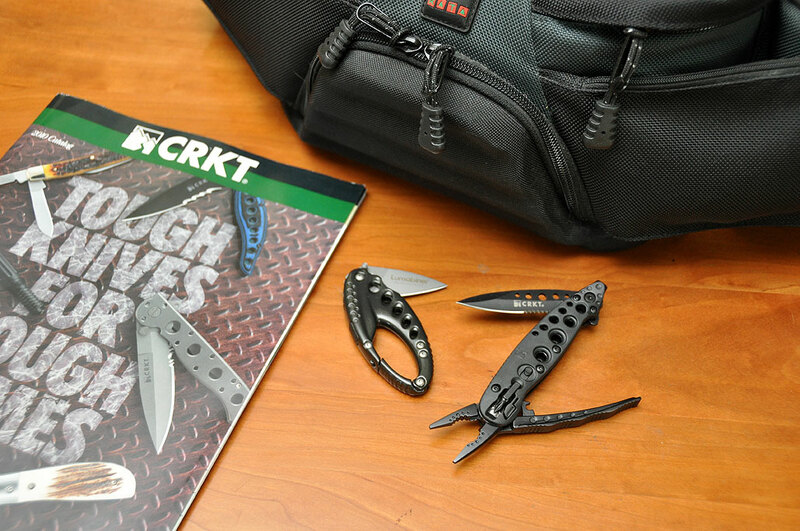 There are quite a few to choose from in the equipment locker, but the two we take most often are the CRKT Lumabiner and the ZillaTool Jr.
We take the Lumabiner because it is easy to hook onto just about anything: belt loop, car keys, bag handle. The ZillaTool Jr. gets the nod because it fits perfectly on the strap of our favorite photo bag. We take them so often that they rarely see the inside of the equipment drawer. Other multi-tools may have more functions, but because these two are so perfectly sized for everyday carry, they are the ones which get used most often. The steel blade opens easily with one hand because of the bump near the hinge. It locks into place with a nice click and unlocks easily with the press of the catch lever. The jaws of the needle-nose pliers are spring loaded. They are locked in place by a slide. The jaws have both flat and circular gripping surfaces. At the base of the jaw is the wire cutter. The screwdriver bits are housed in recesses on the side of the handle. The end of the handle has a hex-shaped opening to accommodate the bits. The bits are held in placeby a magnet at the bottom of the opening. To make it easy to carry, the ZillaTool Jr. comes with an integrated removable spring clip and a nylon sheath. We find ourselves using the clip almost exclusively. The Lumabiner is a simpler tool, but has two of the basic functions (flashlight, blade) that we need everyday. The Lumabiner comes in a variety of colors. The one we have has a charcoal color body with a matte grey blade. We like this combination as we find it blends best with our gear. The carabiner clips on to any convenient loop. There is a slide that locks the latch so it will not accidentally open. We really like the lock as it ensure that the Lumabiner will be there when we need it. Integrated into the Lumabiner’s frame is a bright LED light powered by two small 3V Lithium (CR927) batteries. The round shape fits comfortably in the palm during use. The blade may be opened and closed with one hand thanks to both the thumb studs and the way the blade lock was designed. The entire package weighs less than 2 oz and is just 5″ fully open. We found the Lumabiner to be a little big as a key fob, but others have used it as such. The CRKT Lumabiner and ZillaTool Jr are designed for anyone interested in carrying more than just a sharp edge. 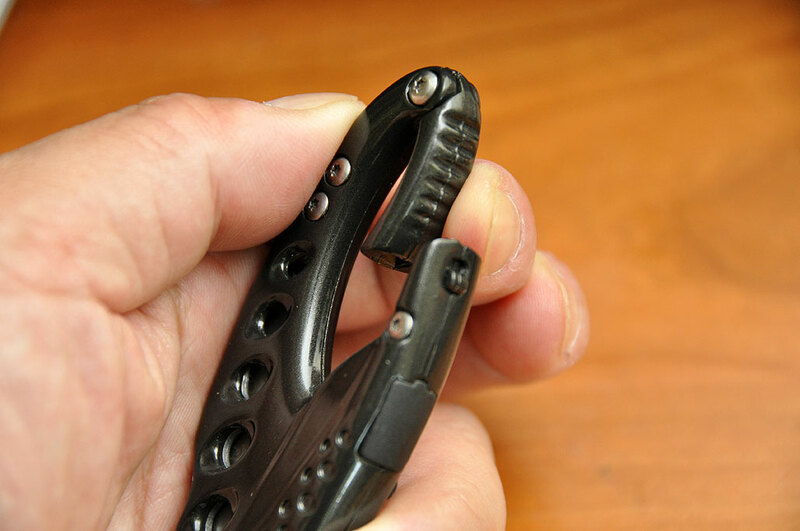 Both multiTools are highly portable, very tough, and simple to use. There are a lot of knife makers out there, but CRKT has shown that they are one of the innovators. We look forward to seeing what they will come up with next! NOTE: Because CRKT is a brand known for their quality cutting instruments, their products are sometimes counterfeited and sold in places such as EBay and other venues. The looks may be similar, but the quality and workmanship of the counterfeits are guaranteed to be poor and shoddy. If you want to trust your tools, buy the genuine article. You will be glad you did when you are InTheWild.